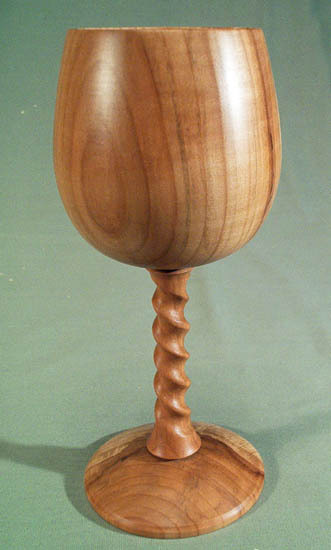 For a decorative goblet, a smaller foot can be used but if the goblet is going to be used, a foot that is large enough for good stability is best. I usually aim for the foot to be the same diameter as the opening in the cup, or just a little smaller than the widest point on the cup. The foot can be any shape you like but I like either a simple curve or ogee. You can make the foot appear thinner and lighter by cutting a small quarter cove on the upper edge. I generally sand and finish the stem and foot at the same time. If you have plenty of spare wood at the base, you can part most of the way through, turn some of the waste wood away to allow access to the bottom of the foot and clean up the surface either with the long point of a skew or with a spindle gouge. If not, part through carefully and sand the base to finish. Remember to make the base slightly concave to ensure the foot stands flat without rocking. For sanding the base, I use a 2 inch rotary sanding pad held in a piece of wood that has been turned to fit the jaws on my chuck. This allows both hands free to hold the object while sanding.